Oomk exposes more of the Metakit core to Tcl than the Mk4tcl binding. It is a pure-Tcl wrapper around Mk4tcl and Mk4too. While Mk4too goes a long way in bringing the more advanced features of Metakit to Tcl, it is a bit rough and tricky to use from Tcl. Oomk uses Will Duquette's Snit ("Snit is Not IncrTcl") as OO framework. Snit has greatly simplified the wrapping process through its delegation feature. And because the outer layer of Oomk is Tcl, it is easy to extend and refine it without having to re-compile any code. Oomk has even proven useful in working around bugs in Mk4too. Oomk is available as a Starkit, i.e. ready to go - download it here. The documentation is inside the starkit, just run it without arguments for details. 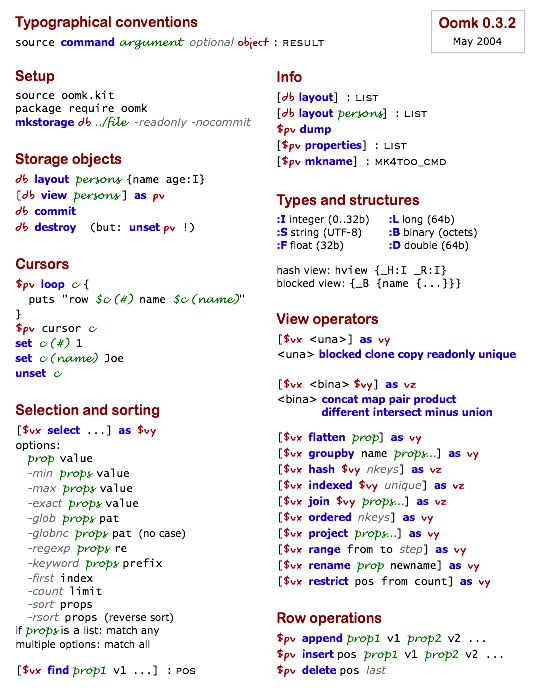 There's a draft one-page cheat sheet overview of all functions. OOMK can be downloaded from the /pub/sk/ area on this server.